(Nanowerk News) Researchers at the Georgia Institute of Technology have developed a technique to study how unicellular micro-algae, known as diatoms, create their complex cell walls. Researchers hope to learn how diatoms assemble these nanometer-patterned, intricate micro-architectures to find better methods for creating nanomaterials in the laboratory. Diatoms are single-celled organisms that frequently appear as a brown, slippery coating on submerged stones and as phytoplankton in the open ocean. Tiny pores in the cell wall allow diatoms to exchange nutrients with the environment and remain at the surface of the water to absorb sunlight for photosynthesis. 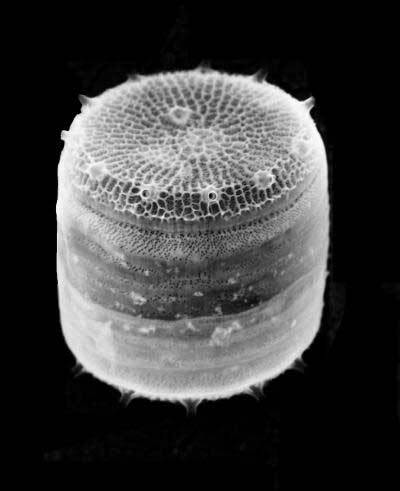 Diatom photosynthesis is responsible for 20 percent of the world’s organic carbon. The pores allow diatoms to be lightweight, but their cell wall gives them a strong mechanical structure. The strength of the cell wall comes from amorphous silica, or silicon dioxide (SiO2) -- virtually the same material as glass. Diatom cell walls show an enormous diversity in form, most of them amazingly beautiful and ornate, depending on specific biomolecules produced by the diatom, Kröger explained. Previous research has shown that uniquely modified proteins called silaffins and extremely long polyamine chains play a role in the structural design of the cell wall. Kröger hypothesizes that the structure of the diatom silica critically depends on the type of silaffin present within the diatoms’ silica-producing organic matrix. Therefore, he expects that changing the “silaffin equipment” of a diatom cell should result in novel silica nanostructures. Kröger and collaborator Nicole Poulsen, a postdoctoral researcher in the School of Chemistry and Biochemistry, have developed a technique to genetically engineer diatoms. The process allows insertion of mutated or foreign genes into the genome of the diatom Thalassiosira pseudonana. Kröger believes this technique will enable the creation of diatoms with novel silica structures. He will describe the technique in an invited presentation on Dec. 12 at the fall meeting of the American Geophysical Union. Genetic manipulation of diatoms will increase the understanding of their cellular biochemistry and potentially enable the use of these organisms for the production of commercially valuable compounds and materials, Kröger said. But inserting a gene through the strong silica cell wall is difficult. The wall must be penetrated, but not broken, and the foreign gene must be accepted into the diatom’s genome, he explained. To insert the genes, such as those that encode different silaffins, through the diatom cell wall, Kröger and Poulsen use a technique called microparticle bombardment. DNA-coated tungsten particles are “shot” on the diatoms under high heliumpressure, thus enabling them to penetrate the strong diatom cell wall. The diatom incorporates the introduced DNA into its genome, and selection of the transfected cells is achieved using the antibiotic nourseothricin. When new genes are introduced with the technique developed by Kröger and Poulsen, they can be expressed constantly or be turned on and off when necessary. Specific details of the technique were published in the October 2006 issue of the Journal of Phycology. Kröger and Poulsen established this technique for the diatom Thalassiosira pseudonana because it is currently the only diatom species with a completely sequenced genome.